1 Estimate your guest list and budget. You might not have a firm grip on your guest list or budget just yet, but you’ll need to know roughly how many people you’re inviting and how much you can spend before you start drawing up your list of dream venues. 2 Consider your big day style. 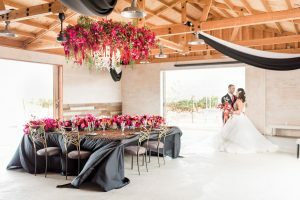 Whether it’s rustic, formal, boho, low-key, or a blow-out bash, the wedding style you and your partner envision will be a big factor in determining where you can host your celebration. Consider whether you want a traditional or non-traditional venue. There are plenty of venues that regularly play host to weddings — even barns and galleries! — but if you opt for a totally non-traditional venue that’s not equipped to host a party (say, an industrial loft space), you’ll be responsible for a lot more details. Wedding-ready venues often have tables, chairs, and linens available for your use and, more importantly, a clean-up crew on hand. If you’re renting out a non-traditional space, remember to factor in all of those details and make sure they are in your budget. 3 Slow down and consider the logistics. Once you have a list of possible venues and begin to visit them, you may find yourself falling instantly in love with the aesthetics of a space. But be sure to slow down and consider the logistics of having a wedding at your dream venue. 4 Think about how much control you’ll want to have over your wedding’s decor and details. Most venues are either full-service or not, meaning they either provide all tables, chairs, linens, and flatware…or they don’t. 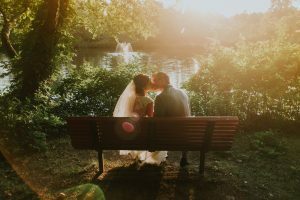 Find out what each venue provides, ask if the venue has any vendor restrictions, and decide whether or not you can be happy with those options. 5 Consider your catering needs. Many of today’s couples are food-savvy and want to serve their guests a very specific menu. But not every venue will allow you to bring in your own caterer, and some may require you to choose from in-house catering menus. You may also have to go with the venue’s preferred baker, meaning you won’t have much choice about your wedding cake. Some venues will allow you to bring in your own cake, but often charge a cake-cutting fee. 6 Visit your potential venue more than once. 7 Talk to everyone associated with your venue. Now that you’re down to a shortlist, you should meet everyone you’d be working with at each venue. 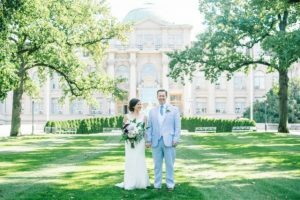 You likely met the venue manager on your first visit, but be sure you speak to any on-site wedding coordinators, catering managers, and tech managers, and ask them to answer all of your questions. 8 Talk to other couples and vendors who have used the space. Get the inside scoop on your venue: Is there anyone who is difficult to work with? Any spatial shortcomings you should know about? Any rave reviews? How’s the food? Talk to everyone you can about your venue and get a really good sense of what it would be like to marry there. Hint: If your venue doesn’t have great pictures on their website (which is often the case) search for the venue on Lover.ly or on local photographers’ blogs to see better images from weddings that were held there. 9 Check on requirements for religious ceremonies. If you plan to have a religious ceremony, find out whether or not you’re required to have it in a house of worship. If you are, book the ceremony before booking your reception venue. If your religious leader is able to come to your chosen venue, find out if they’re available around the time of year you want to marry. Having an interfaith wedding? Be sure you speak to all religious leaders and families involved; your ceremony will take some time to figure out and you’ll want to find out if either religion has particular venue requirements. — By Stephanie Hallett and contributed to by Claire Aven.